I recall a TV show (Forgiving Dr. Mengele) about an elderly Jewish lady (Eva Mozes Kor) who went on a journey through her own childhood and her time in Nazi concentration camps. As a child, she witnessed the horrors of the genocide of her people, and the death of her parents. She returned to the camps where brutal and sickening experiments had been carried out by sadistic Nazi doctors. She heard to tales of so many other survivors. She even met with ex-Nazi officers who had been stationed at the camp she had been held. An incredible tale of survival, chance and death. Two things about this show stood out to me. Firstly, she forgave the officers she met. She even forgave the officers that had long since died. She even forgave those that had been responsible. Her reasoning was simple; she didn’t need the pain any more. She explained that in forgiving these men, she was not letting them off the hook. Those that were dead would feel nothing regardless, and the ones she met already had more than enough grief of their own. She saw her act of forgiveness as giving herself permission to let go of the grief she had and to open to door to find happiness again. The second thing that stood out for me was the reaction of many of her Jewish peers. They were outraged that she would do such a thing. They would not be forgiving any German, alive or dead, for what had been done to their ancestors. I am not sure if any of these indignants interviewed in the show were actual survivors, just descendants. Such was their shock that this sweet and unassuming lady could forgive was rather surprising. Both these points got me thinking of holding a grudge and the act of forgiveness. I have played a few characters that hold a bias, or grudge. One in particular was the psychopathic German swordsman, Zastrozzi. While the play is a comedy, coming to grips with a character that has basically accepted the fact that he is an agent of evil, and the incredible grudge he has for his day-dreaming, delusional nemesis, was challenging. I like being the nice guy. Even when playing computers games where you can choose actions that are good, neutral or nasty, I feel compelled to play the good guy every time. Playing nasty just doesn’t feel right. So playing a nasty guy was a rather enlightening process. There is a saying that everyone has a dark side. After Zastrozzi, I would rephrase this as everyone has the potential to do bad things. In coming up with a character, I try to conceive a life story that would give foundation for their current beliefs and goals. In the case of Zastrozzi, how does one acknowledge that they are evil, and that this is ok? His grudge was less challenging, but more on that later. I envisioned a number of various scenarios ranging through his life where he was basically left to fend for himself. A serious of unfortunate experiences which taught him that quick and violent action was they way to avoid unnecessary emotional pain, and interesting contradiction as violent action is in itself emotional pain. A case of fighting fire with fire. He lost important people in his life at the hands of cruel and merciless people. From these experiences, he developed a growing hatred for people in general and took it upon himself to rid the world of evil, but the more he looked, the more he saw it in everyone he met. He learnt to use the sword and mastered it. He became notorious and others sought him out to challenge or kill him. His reputation grew. Then the father and brother of a man he killed went to seek revenge. They found only his mother, the only good person left in Zastrozzi’s life. In a rage or out of frustration, they killed her. Upon hearing this, Zastrozzi began a singular quest to find and kill them both. Many years later, the son is still on the run in the charge of his carer, after the father had died naturally. 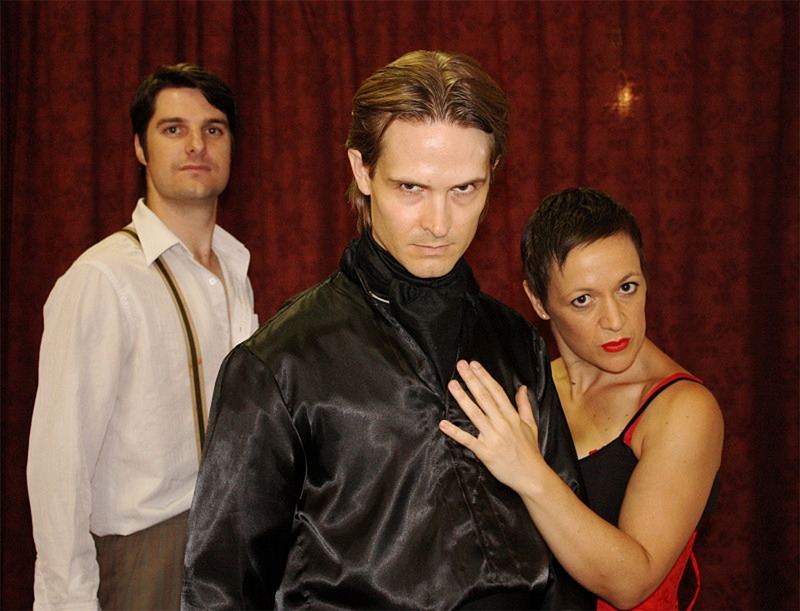 Zastrozzi is close behind and has become obsessed with finding to one man left to kill. This is where the play takes up from. All this has been the story I built to help me fill to role. My character has a rapidly deteriorating sanity as his extreme intellect is gradually being eroded by his overwhelming need for vengeance. Basically another case of emotions over powering reason. I have said before, there is drama in conflict, and conflict is frequently driven by emotional persuasions. In this posting, I have reviewed a lovely lady overcoming deep pain by applying rational when in contrast, her peers are still feeling the emotional trauma. I have also played a man who’s mind has become twisted and unstable through extreme emotional trauma. The character of Zastrozzi is certainly more dramatic than the lady, but who is happier? In life we seek peace and happiness. In fiction we seek drama. Bit of a contrast. Occasionally we seek happiness in the drama of others, which I feel my to be a healthy approach. I think I have found a path to peace and contentment at the very least through my experiences playing these emotional parts. The lesson would seem to be that allowing emotions to govern your actions, is harmful. Yet allowing your intellect to govern instead seems equally unhealthy. No compassion. No empathy. We have all known someone like this, and is the spirit of not making this blog too long, I may save the emotionally dead intellectual for another day. After all, this one is about grudges right? To wrap this one up, I have learnt that a grudge can actually do more harm to the beholder rather then the beholden. Most of the time, the subject is completely unaware of any animosity until something brings it to light. Seems to be an awful waste of energy.